Our tables are more than just tables. They are functional pieces of art, custom built just the way you want, that will last you for a lifetime. Every one of our strong chunky tables has been designed to exhibit awesome natural materials in their raw beauty. 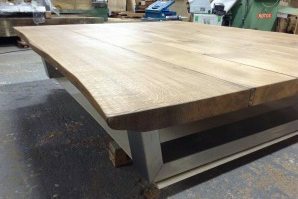 We only use single pieces of authentic solid oak, no laminated small pieces of oak and no veneers that can split apart and make your table look shabby as it ages. 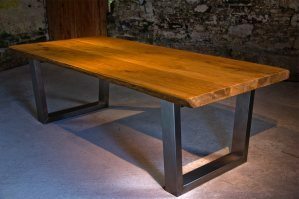 Instead each design uses intelligent joints that allow the single pieces of 100% natural solid oak to breathe and age so your table will stay strong and stunning in your home for a lifetime. Every Table is custom made exactly the way you want it, and will be delivered and assembled by our specialist team so you won’t need to lift a finger. 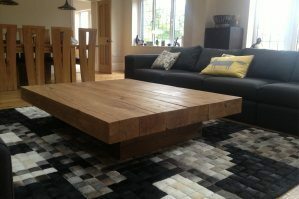 We also sell a range of Oak TV Tables, and Solid Oak Side Tables.